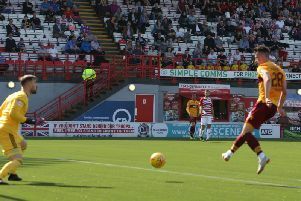 Centre forward Danny Johnson is Motherwell FC's third signing of the summer, ahead of the 2018/19 campaign. “I'm very excited to join the club," Johnson, who will wear number 24, said on his arrival. "It's the next stage I've been working hard for. I feel I have progressed in the last few years. Motherwell, having reached two cup finals last season, is a club only going in one direction and I want to be part of that." Asked what he will bring to the team, Johnson added: "When I am asked that, people get bored of me saying 'goals'. But I know the team create a lot of chances, so I firmly believe when I get the chance, I will put the ball in the back of the net. "As soon as the manager rang, it all happened very quickly. I didn't need to think hard about it. It sold itself. I knew I had to come. I wanted to come." "We are delighted to add Danny to the team," Motherwell boss Stephen Robinson said. "He will add to our options up top and give us another goal scoring threat. "Danny has scored a lot of goals in the last few years and comes in from a level where we have signed a lot of players in recent times who have done very well for the club."